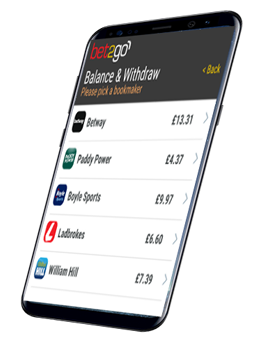 Bet2Go is a state-of-the-art betting App that is integrated with bookmakers to provide users with the simplest, and quickest, way to compare odds and place bets and obtain Free Bets. 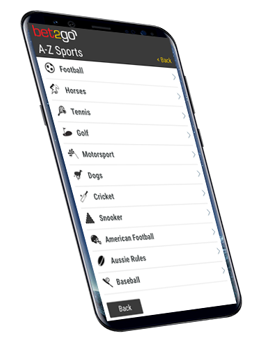 You can open up bookmaker accounts, deposit and withdraw money, and of course place bets, all without leaving the app. The browsing is lightning fast, so you can find the best odds and tips fast and efficiently. Placing a bet takes no more than 30 seconds from starting up the app, and you will get your bet confirmation immediately. We cover all the major sports , and offer a very large selection of events and bet types for each, Match Betting etc. Football, Horse Racing, Tennis, Cricket, Golf, NFL, NBL, and many more. Also "Special Sports Events" such as the World Cup, Ascot, Wimbledon, The Masters Golf and more.. 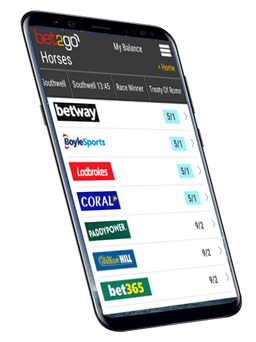 The app carries thousands of events, and over half a million odds at any time, all at your fingertips when you want them. We also have live odds so you can place your bets even during an event. and if you are interested in accumulators, you can also compare odds on those in the app. You will never place a bet again that is not at the best price in the market, as we have all the latest betting odds. You can manage your accounts with the major bookmakers on our service. Open up an account you don’t have yet, with 1 click, or add the ones you have already to check out where your money is with one quick glance. And we even enable you to withdraw your winnings, or deposit money into your account to place your bets. All this in just one or two clicks. Place bets securely and quickly, from within the app. There is no need to log in to a bookmaker website, as we do all of the boring work in the background.